I'm excited about the Attack of the Wargs and the Escape from Mirkwood Spiders sets....until I see the price. The wargs look cool and I'd like a chance to get all those hair pieces and torsos. Yeah, I'm a bit worried about the price tag, but the most of the LOTR sets seemed pretty fair, so I won't write this off as a massively overpriced wave yet. Anyway, new pics from fbtb; no, nothing really new, but higher def and a few more angles. Wait, is it just me, or is it odd that they don't have the three-trolls-turned-to-stone scene? Last edited by Ryclen on Thu Oct 11, 2012 4:08 am, edited 1 time in total. Ryclen wrote: Yeah, I'm a bit worried about the price tag, but the most of the LOTR sets seemed pretty fair, so I won't write this off as a massively overpriced wave yet. Agreed. But as Bruce was saying, these do look like great parts sets for castle. Olive leaves, lots of tans, browns and greens. Love it. The prices seem to be about what I expected, except that Warg Attack would be better of around 39.99 to 49.99 in my opinion, but this must be the Weatherrop of this series! My thoughts on these sets are quite underwhelming. I am a huge LOTR fan and have gone crazy over the LOTR wave of sets, but after seeing these I am not anywhere near as impressed. Hopefully as I get a closer look at the store I get a little more excited, but as of right now I am thinking that several Mirkwood Spider sets to build up an elf army(and red leaves!) is about all I want out of this line right now. I don't think those prices are confirmed, so I'll take them with a pinch of salt. But still, if true, those will be rather expensive. All of those seem pretty over priced, except for the goblin king and bag end. Ooooh, really like the Warg set. BIG tree! Rest of the sets are nice too. Riddles for the Ring has some good parts, as well as a cheap Gollum and Bilbo. The goblin King Battle has a big ugly goblin, but other then that, lots of nice parts. Escape from the Mirkwood Spiders seems to be the most unlike the book, but the fact that it has red foilage, makes up for it. Barrel Escape has, well, barrels! and lots of other nice parts, and figs. Looking forward to when these come out! I am a bit underwhelmed by the design of some of these sets in comparison to those in the LOTR wave. The Mirkwood spiders in particular look rather dire. Saying that, there are certainly some nice parts and minfig elements - and the new Wargs are welcome (would be great for anyone doing a Game of Thrones MOC for example) as are the nice printed map tiles. I am a bit concerned that the Goblin King looks as big as the Cave Troll from Mines of Moria though! Of course, all this may change once I can actually see the sets but for the moment I am looking at them more for parts than anything else. TeufelHund wrote: I am a bit concerned that the Goblin King looks as big as the Cave Troll from Mines of Moria though! I've you've seen the preview trailer for The Hobbit movie, that's about the size of the Goblin King in the film. I agree that most of these don't look quite as good as most sets in the first wave. I made sure to get every set from that. This time, I think I'll be much more selective. I do think it appears to be following the film design very closely, so maybe I just won't be a big fan of the movie's look. I have to say that I love most of the sets. Riddles - Nice brick built rock and 2 great figs. I like gollum's new expression. The parts are useful. Warg attack - I like the warg mold. The colors are just ok. I hope we get some tan and brown wargs in the future. That tree is just ugly and horribly designed. I do love the olive tree parts though. The orc leader is a pretty ugly fig. Unexpected gathering - This is a breat build. The green and neutral color parts should be pretty useful. I like the little extras like maps, food, in the set. Barrel escape - This is an attractive build of nice neutral colored bricks. The elves again are incredible. I love the big barrels, bottles, goblets, etc. very useful. Goblin King - I think the terrain looks great in this set. These parts are very useful. The goblins look pretty good but the skull caps make them look a little top heavy. The goblin king turned out much better than I thought he would. The biggest thing for me in these sets are the torsos. Only Kili's has a small splash of flesh as far as we can see. If TLG were to release civilian castle sets yearly for the next ten years I doubt we would get a variety of colors and style of torsos the dwarves give us! Just look at the nobles, adventurers, peasants, and merchants you can make with those. My castle world is going to be much more diverse with these available. I will be adding these to the LOTR torsos in my collection. Deskp on Eurobricks made this photo for comparison. In the book, the Goblin King is about to eat Thorin when Gandalf comes in to the rescue with wizardry and Glamdring, so he's always been depicted as an especially large and foul Orc. I'm just more upset that my favorite Hobbit moments seem glossed over. To me this is a journey and development of the life story of Bilbo; so skipping over the Mountain Troll camp where Bilbo first burgles (and where Orcrist and Glamdring are found), skipping Rivendell (again?!? ), not making Bilbo who now possesses the Ring of Power, the legendary warrior who drives off the Spiders (which even the Dwarves account for in his Red Book), and the friendship of the Eagles saving the weary and cornered Dwarves once they did emerge from the Misty Mountains; those are all big deals. Whether it is just due to LEGO drawing all this out over a 10 year license, a fault of the studio producing it or an actual total biffing of the story has yet to become apparent, but it bothers me. "I like six eggs with my ham, when starting on a journey: fried not poached, and mind you don't break 'em. I won't eat a broken egg." Thanks for that picture DaleDVM. It's cool to see all the minifig to movie character comparisons. Some of the Hair pieces and torsos look amazing. I'm not concerned about how some of the differences play out between the movie and the book. I'm even less concerned about how the LEGO sets are interpreted from the movie. I'm already looking at possible yellow head replacements for the flesh ones. Do we have a release date for these yet? 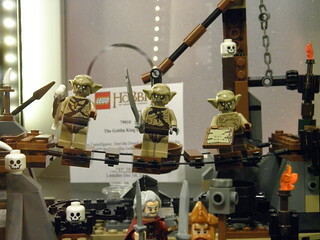 I need to quit buying Lego for a while to save up some moolah for these babies. AK_Brickster wrote: Do we have a release date for these yet? I read that the sets will be released somewhere in the first week of December, but I'm not sure. Man, those things look ugly. Can't wait to pick some up!